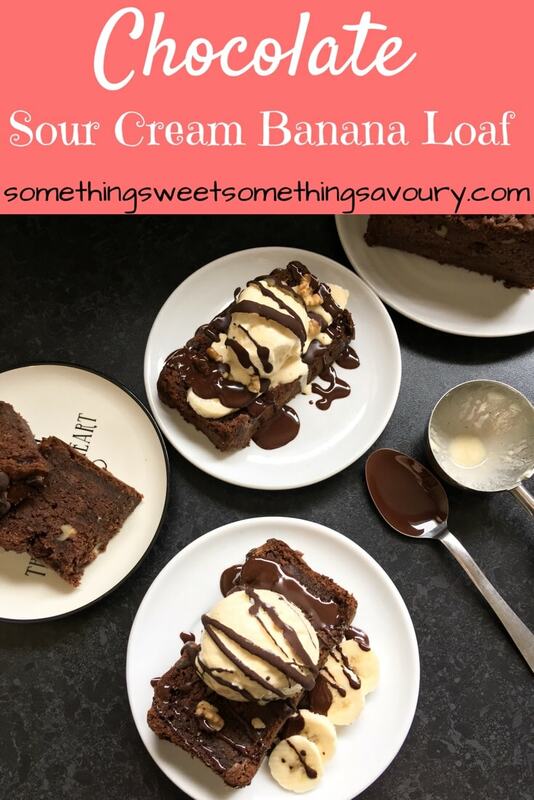 This chocolate sour cream banana cake is a great twist on a classic recipe – enjoy it as it is or serve with ice cream, sliced bananas and chocolate sauce for a gorgeous dessert. Ok, I’ll admit it. I always buy extra bananas in my weekly shop so I’ll be able to bake with them. 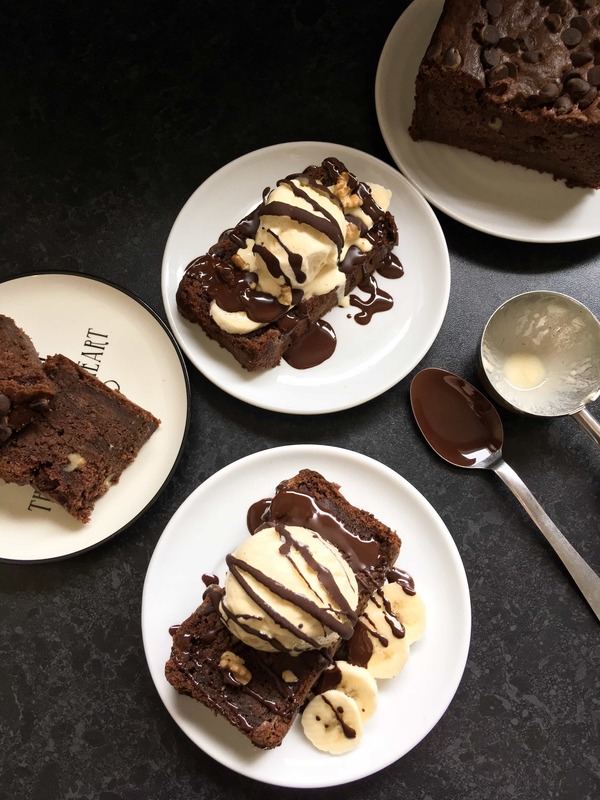 Banana bakes in any form always seem to go down extremely well in my house – my chocolate chip Nutella swirled banana muffins and chocolate chip peanut butter banana loaf are often requested. I’ve made them so many times I could probably do it in my sleep! The key points to absolutely nailing this banana cake? Very ripe bananas. You absolutely must use overripe bananas in this recipe. The spottier and brown the better. I know bananas don’t look particularly nice this way, but they will be perfect for baking! Brown sugar. Using soft brown sugar gives a lovely moist (sorry, I promised myself I wouldn’t use that word but I can’t help it!) cake. Sour Cream. I love using sour cream in baking – it provides a really soft crumb and….well, just try it and see! Cocoa powder and chocolate chips. The cake gets a double hit of chocolate in the form of cocoa powder and dark chocolate chips, but you could use a bar of chocolate chopped into random sized pieces if you prefer. Grease and line a deep loaf tin - the one I use measures 5x9 inches, and is 4 inches deep. I would NOT recommend using one any shallower - this is quite a deep cake, and using a shallower loaf tin would result in overflow! In a large bowl, sift together the flour, bicarbonate of soda and cocoa powder. Set aside. In a large bowl, cream together the butter and sugar until light and fluffy. Gradually add the beaten eggs, beating well after each addition. Beat in the vanilla. Stir in the mashed bananas, walnuts or pecans if using, chocolate chips and sour cream. Fold in the dry ingredients until just combined. Quickly pour the mixture into the lined loaf tin. Sprinkle the remaining 25g chocolate chips over the top and bake for 60-80 minutes or until a skewer inserted in the middle of the cake comes out clean. Preheat the oven to 180C/160Fan/350F. Grease and line a deep loaf tin In a large bowl, sift together the flour, bicarbonate of soda and cocoa powder. Set aside. In a large bowl, cream together the butter and sugar until light and fluffy. Gradually add the beaten eggs, beating well after each addition. Beat in the vanilla. Stir in the mashed bananas, walnuts or pecans if using, chocolate chips and sour cream. Fold in the dry ingredients until just combined. Quickly pour the mixture into the lined loaf tin. Sprinkle the remaining 25g chocolate chips over the top and bake for 60-80 minutes or until a skewer inserted in the middle of the cake comes out clean. Leave to cool completely in the tin. These look absolutely incredible.What a great combo and so versatile. I am on such a chocolate quest at the moment. Can’t get enough of it! Thank you! I figured adding lots of chocolate can never be a bad thing! ?? Oh my goodnesz, this cake looks like a real winner! I would have loved to try a big slice! this is chocolate heaven!! delicious! Thank you so much Jo! It was Nigella who got me into baking with sour cream. 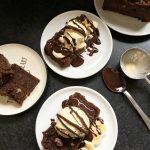 I always try and have a tub in my fridge – it’s a very useful ingredient ? Thank you! It’s so great that you can turn mushy bananas into something really delicious – I can’t abide them when they turn really brown but I do love banana cake ? Thank you so much. We all really enjoyed it. Thank you – it was such a treat! OMG this looks gorgeous. Thanks for sharing. Have a great day. Thank you so much, have a lovely day too ?